Appearance: (6) Much more Sahara than Garden of Eden, but we swooned over the oozy, melty, occasionally crispy cheese coating. Quality of Ingredients: (6) We were expecting more substantial pieces of bacon, but they were so small to be almost powdery. Still, this “bacon crust” provided nice crunch and flavor. The chips were thick and freshly fried, and we love potato chips, but they tasted a little overdone at times. The cheese was excellent and deliciously melty. Distribution of Toppings: (7) Once again, the bottom layer of cheese on the plate blew our minds. There was so much cheese, but even on these, the sour cream was a little cloying. 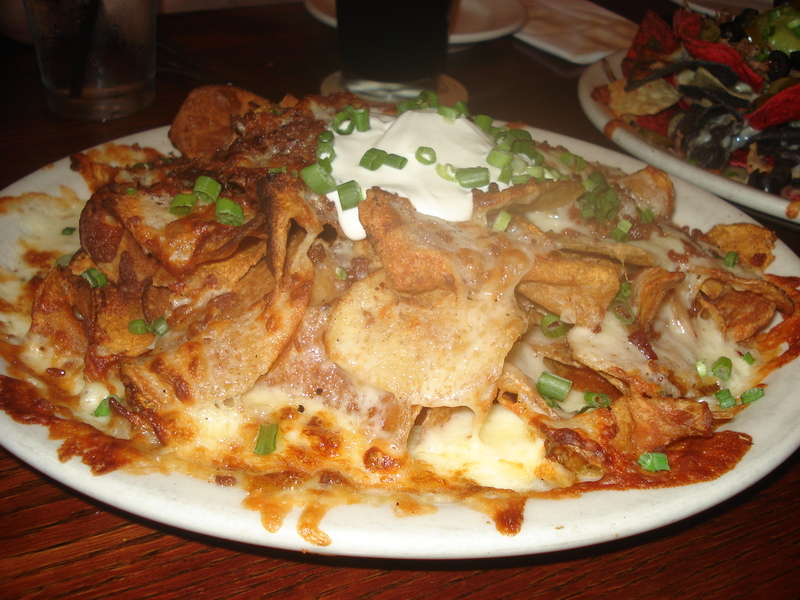 With these nachos, they omitted all the lighter ingredients and gave us the straight goop– greasy, gloppy and artery clogging. It was a little much, and difficult to eat. Price: (8) At $7.99, these come out to approximately 1,376 calories per dollar. Quite the value, eh? Depends on how you count. Overall: 27. It’s a good concept but not for the faint of heart. Seriously, they should require a doctor’s note and an electrocardiogram before they place your order. Yum! I made potachoes the other night at home – definitely not for the faint of heart! PAM! Potachoes! Best word of the year…and every year.